Mohamad Alipour envisions a day when an inspector will send a robot to shoot thousands of images of hard-to-reach portions of a bridge and then feed them to a computer, which will review them and flag areas of potential danger. The engineering graduate student’s work exists at “the intersection of machine learning, visual recognition and civil engineering,” he said. Alipour, who came to the U.S. from Iran in 2014 to pursue his Ph.D., said robots and computers have the potential to greatly enhance the state of the art in structural inspections. Autonomous robots can scan bridges and take thousands of photos and videos searching for cracks and flaws. The question then becomes how to use the huge amounts of collected data. “Machine learning” refers to a series of methods and algorithms used to teach a computer to do things that humans normally do, and “deep learning” is a subset under the machine learning umbrella. Many of these approaches leverage artificial neural networks, which create a set of models based on structures inspired by the human brain and the corresponding biological neural network. This approach creates the foundation for basic functions, such as image recognition using a computer. “We are training models to be able to detect features of interest in imagery coming from a variety of sources, including drones,” Alipour said. “For example, cracks are of interest to us, and so are corrosion, section loss, and many other modes of damage and failure in transportation infrastructure. To create their visual recognition models, Alipour and the other researchers feed the computer thousands of images of structures such as bridges with the cracks clearly marked, so the machine can determine or “learn” what cracks on a surface look like. The researchers take high-resolution images, zoom in on the image to the pixel and then have experts manually find and delineate the crack on a touchscreen. This serves as the training data for the deep learning models. To distinguish, Alipour said they also add intentionally distracting images such as expansion joints in concrete sidewalks, marked “not cracks,” so the algorithms can distinguish between a crack in a road surface and crack-like features, such as a joint between two paving panels. “Mohamad was certainly the catalyst for much of the work we are doing now within the group, and we have some staggered overlap within the group, so I anticipate that this work will continue after he graduates,” Harris said. Machine learning also would allow what Harris and Alipour refer to as “citizen engineers,” where people could take pictures with their mobile devices of condition features in urban infrastructure such as potholes, or what they perceive is a structural problem, and send them to a computer that would analyze them using the trained visual recognition models. 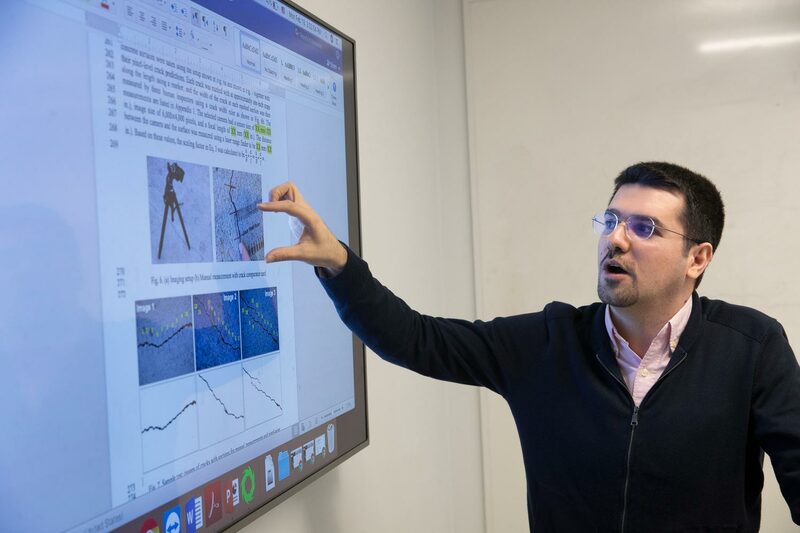 While Alipour is working on visual recognition models, robotic application is also a future component of the project and he is developing collaborations with researchers across the Engineering School, largely through the Link Lab in Olsson Hall. Harris said he has had a positive experience since joining the Link Lab a year ago. Alipour’s work has been recognized beyond his immediate colleagues. He has received an $8,000 O.H. Ammann Fellowship from the Structural Engineering Institute of the American Society of Civil Engineers for his research and to recognize what he can contribute to structural engineering. Alipour likes it when people appreciate his ideas and his work, noting that two years ago he was awarded first place for presenting his ideas in UVA’s fifth annual “three-minute thesis” competition for graduate students.